SIGNET Electronic Systems has recently relocated to a new state-of-the-art headquarters. On April 6, the company moved to a completely renovated, 26,500-square-foot facility at 90 Longwater Drive in Norwell, MA. SIGNET is among the largest privately held systems integrators in New England with annual revenues approaching $40 million, 138 employees, and satellite offices in Scarborough, ME and East Providence, RI. SIGNET began as a four-man installation services contractor in 1974, and since 1992, has tripled its workforce. In addition to the 700-plus projects the company already completes each year, SIGNET’s increasing involvement in the transportation communication sector had recently brought a new sense of urgency to the need for the expanded facility. The added square footage provided by the new space will accommodate a greater number of engineers, production technicians, and project managers, as well as provide a 2,400-square-foot area for production, assembly, testing, and certification. A 14,000-square-foot, environmentally controlled warehouse will provide the ability to properly receive, organize, and stage project equipment. SIGNET partnered with ArchDesign, a Massachusetts-based architectural design firm, and Callahan/Hoffman Company, a Massachusetts-based commercial construction company, to engineer and build out the $2 million renovation. The design is intended to reflect the openness of SIGNET’s collaborative workflows and culture, leveraging the use of windows and glass to capitalize on natural light. With more than 50 percent of SIGNET’s team members working in the field and living across four states, the spirit of collaboration extends beyond the walls of the new office. The comprehensive audiovisual package includes Crestron touchpanel control with SIGNET-branded graphical user interface for training and conference rooms, bring-your-own-device (BYOD) Skype support across multiple locations, and 4K monitors for presentation spaces. 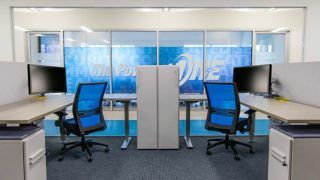 The 50-person training room includes a USB media bridge for audio-video recording capabilities, while strategically located digital signage enhances corporate communication by displaying topic-specific content in respective departments. The company also incorporated a complete passive and active data infrastructure including a new data center with redundant firewalls, fiber connectivity, UPS backup, and IP climate-control HVAC. The security package includes a unified IP access control and CCTV system and zoned intrusion detection system, which are anchored by a Genetec platform. Finally, SIGNET installed exterior LED lighting, which is controlled via a networked lighting control panel for granular schedule and lighting scene control.